Happy Monday Gang! I’m still truckin on this fitness journey and six-week #fasterwaytofatloss boot-camp. This morning began day one of week two in this carb cycling, intermittent fasting, HIIT training (still not sure what that means but ok? ), heavy lifting, speed burst training, and insulin manipulation cycle…thanks to the fitness gem and mastermind @amandatress. “HELP ME!” Just kidding! I actually feel great, I notice I already have more energy, I am getting the workouts completed in the morning (and I AM NOT a morning person), I have zero hunger pains, cravings, and I think I am losing weight. (part of this boot camp is to not weigh or measure until the end) I whisper this mantra daily….”Progress not Perfection!” but boy, will I be stoked at the end of this six-week journey if I have shed those lbs and lost inches! It is November 14th and I just had a moment today realizing that Thanksgiving is nearly a week away! November is notoriously known for pilgrims, Tom turkey, and pumpkin pie but did you also know it is American Diabetes month? One of my best friends was recently diagnosed with type-1 diabetes and several of my family members are type two. I wanted to share with you a recipe that has not only been great and filling for my fitness journey but is also beneficial for anyone with diabetes. It is the peak of beet season here in Bluegrass and I love heading to our local coop and seeing all the varieties and vibrant colors of beets. What better salad to enjoy the cool breeze and rust orange leaves than this Roasted Beet salad. Beets are highly nutritious and are a diabetes-friendly root vegetable. Certain unique pigment antioxidants in the root as well as in its top greens have found to offer protection against coronary artery disease and stroke; lower cholesterol and blood pressure levels within the body, and have anti-aging effects. Beets are low in calories, containing just 43 calories per 100-gram serving. They are high in levels of antioxidants which mop up damaging molecules called free radicals that can harm blood vessels. They are also high in phytonutrients called betalains, which help reduce inflammation. They also contain no cholesterol and very small amounts of fat. Preheat oven to 425°F. Wipe or scrub beets clean then trim stems down to one-inch (leave “tails” on). Place beets on a large piece of foil; drizzle with olive oil, then wrap foil around them to form a neat packet. Roast directly on rack in middle of the oven until tender, about 45 min-1 hour. Test for doneness by piercing the largest beet with a knife. If it enters easily, it’s done. Unwrap beets and let sit until cool enough to handle. Use your hands or a paring knife to peel skin, then cut into ½-inch dice (I usually do this right on the aluminum foil but you can also use a stain-proof cutting board or plate). Set aside. In a small bowl, whisk together the honey, mustard, red wine vinegar, shallots, garlic, salt and pepper, and a pinch of sugar. Whisking constantly, slowly add the oil in a steady stream. (Alternatively, add all your ingredients to a jar, cover with lid, and shake vigorously to blend.) Taste and adjust seasoning if necessary. Place the greens in a large bowl, drizzle with about half of the vinaigrette and toss to combine. Add as much of the remaining vinaigrette as desired and toss again. 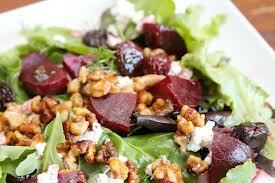 Divide greens onto plates, then sprinkle with beets, walnuts, green apple slices, and goat cheese. (The reason you don’t just mix it all together in a salad bowl is that the beets would cause the whole salad to turn pink.) Serve immediately. Previous Post Maximizing Macros and I Still Eat Bread! Next Post For The Love of Fruitcake!